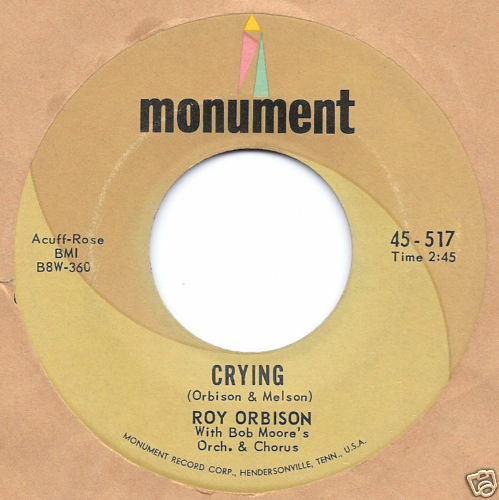 Roy Orbison left the small Monument label during 1965 to sign with the large MGM Label. The good news was he received one million dollars for signing and that was sixties money. The bad news was it would be over thirty years before he would have another top twenty hit in The United States. Many of his MGM single releases were not very good. One exception was the gentle up-tempo ballad, “Cry Softly Lonely One.” It may not have been of the quality of his Monument hits but it was close. It only reached number 52 on The American singles charts during 1967 but deserved alot better. 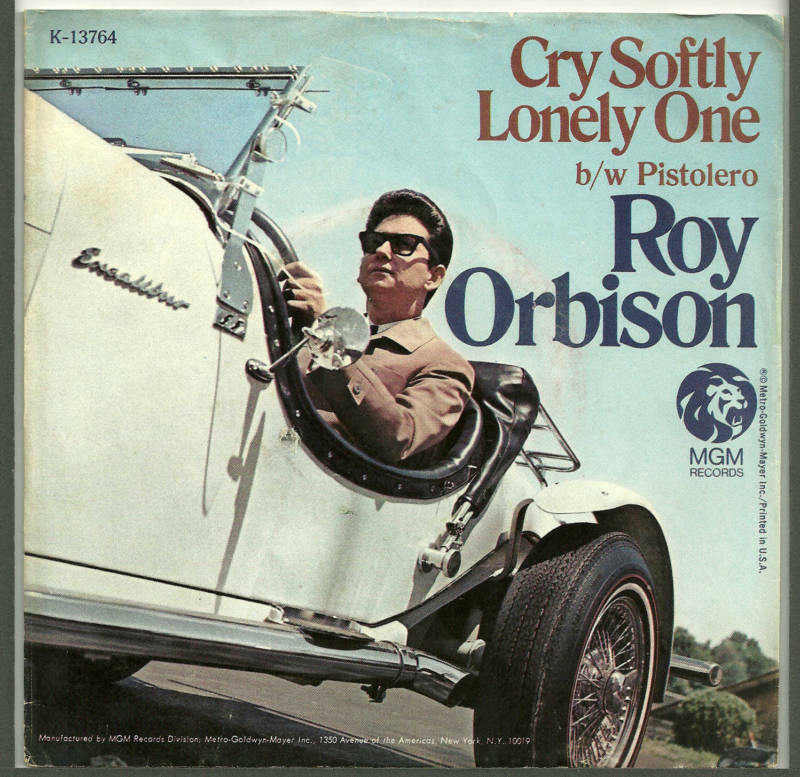 “Cry Softly Lonely One” remains one of the few highlights from Roy Orbison’s years with MGM. One of the grand ballads in music history. It was a haunting song of love lost. Orbison’s vocal would rise and rise and just when you thought it could go no higher it did. It reached the number two position on the American singles charts during 1961. ROLLING STONE MAGAZINE ranked it as one of the top one hundred songs of all time. It is now safely a member of Grammy Awards Hall Of Fame. It remains one of the more spectacular vocal performances in rock history. A Classic song by The Band which became a huge single hit for Joan Baez. “The Night They Drove Old Dixie Down” is a history lesson in about three minutes. This tale of the Civil War and its aftermath fit the folk style of Joan Baez well. The Band produced a wonderful rock version, complete with harmonies, that became a concert staple for years. Joan Baez simplified the song and placed the emphasis on her clear soprano voice. It was the highest charting single of her long career as it reached the number three position on The American charts during 1971. This is one of those songs that never grows old as it tells a wonderful and poignant story. 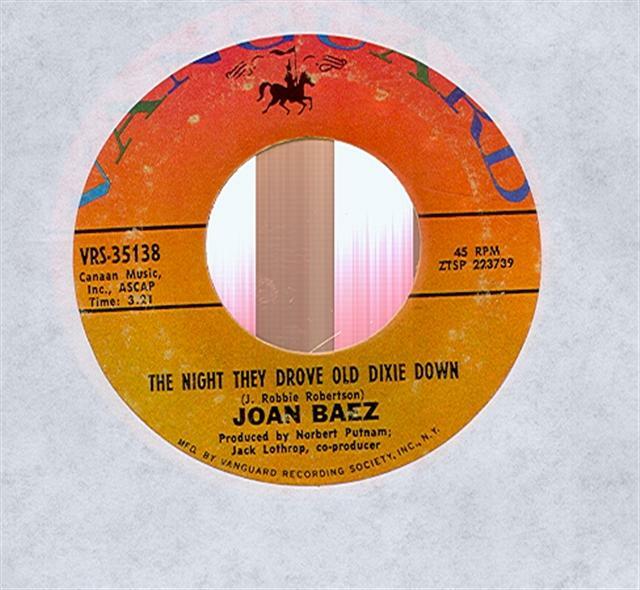 “The Night They Drove Old Dixie Down” by Joan Baez is seventies folk music at its best. “Hello I Love You” was one of he earliest songs written by members of The Doors. It was not included on their brilliant debut album and likewise was left off their second release, STRANGE DAYS. It finally saw the light of day on their WAITING FOR THE SUN album. 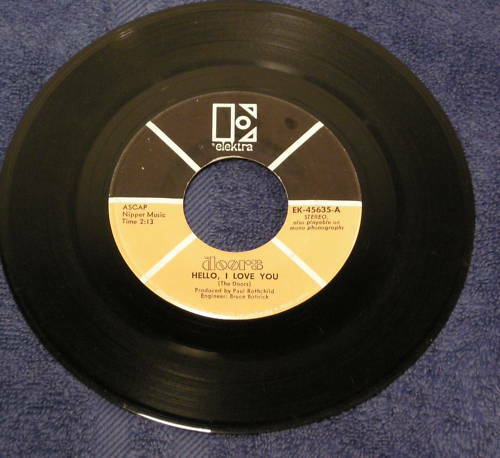 It was worth the wait as “Hello I Love You” became their second number one single topping The American charts for two weeks during the summer of 1968. It helped to make WAITING FOR THE SUN their only album to reach the top of the charts. It is a classic Doors song featuring Jim Morrison’s vocal and a great guitar intro. by Robbie Krieger. It stradeled the line between hard and psychedelic rock and was a perfect vehicle for Morrison’s over the top live performances. “Hello I Love You” remains one of the better songs from The Doors catalogue and holds up well over four decades after its initial release. 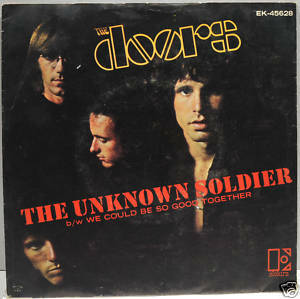 “The Unknown Soldier” was the first single released from The Doors third studio album, WAITING FOR THE SUN. It was a biting political commentary on The Vietnam War which was raging at the time. It proved to be a little to controversial for AM radio as it only reached number 39 on the American charts during March of 1968. The song came complete with gunshots and long pauses which while heightning the tension of the lyrics, took away from the musical flow. When The Doors performed the song live, guitarist Robbie Krieger would shoot Morrison with his guitar. While it was a bold statement, it would be lost in the many protest songs of the day. The Doors would return to their dark psychedelic roots leaving behind this artifact of The Vietnam era. Guitarist/vocalist Graham Russell and lead singer Russell Hitchcock met about 35 years ago and Air Supply, with a rotating cast of other musicians, has been producing its brand of light pop/rock ever since. Many people remember them from a series of well-crafted albums and singles issued during the 1980s. Songs such as “Lost In Love,” “All Out Of Love,” “Every Woman In The World,” “The One That You Love,” “Here I Am,” “Sweet Dreams,” “Even The Nights Are Better,” and “Making Love Out Of Nothing At All” were all radio staples and top five single hits. When you add in tens of millions of albums sold, Air Supply reigned as one of the kings of lightweight eighties rock. The hits may have stopped, but Air Supply continues to release their brand of music and tour constantly. Mumbo Jumbo is their first studio release in a number of years and it finds them in fine form. At this point they are who they are, and wisely they don’t make any dramatic changes to their sound. The songs are still well-crafted and their harmonies remain intact. Ballads have always been their staple and tracks such as “Hold On,” “Why,” and “Until” continue this trend and will not disappoint their fan base. The surprise is the number of up-tempo pieces. “Dance With Me,” “A Little Bit Of Everything,” “Faith In Love,” and the title track are all nice additions to their catalogue as they explore areas they have not visited in years. “Me Like You” even comes perilously close to rock. As with all of their albums, it is well produced and the sound is crystal clear. Graham Russell’s songwriting ability remains intact as he wrote or co-wrote all fourteen tracts. Their voices may not be as strong as during their classic period but they remain fine instruments. Mumbo Jumbo will appeal to their generation of fans and is for anyone who is inclined toward the softer side of popular music. Peter Wolf roomed with eclectic film maker David Lynch while in school, married (and divorced) actress Faye Dunaway, and fronted the legendary J. Geils Band for close to sixteen years, 1967-1983. He still re-unites with the band every now and then as they and Aerosmith will play together in Boston’s Fenway Park August 14, 2010. He has now returned with his seventh solo album and first in over seven years. It was well worth the wait as in my view it takes its place as one of the better releases of the year thus far. While he is now reaching the traditional age of retirement, Midnight Souvenirs proves there is a lot of life left in this old rock ‘n’ roll dinosaur. The album is grounded in the type of melodic rock which made him famous but he stretches out into some blues and a little country along the way. He voice is still a fine instrument and his songwriting ability remains superb as he co-wrote twelve of the fourteen songs. While a number of strong up-tempo rock tracks grace the album it is three ballads with vocal duets which are at the heart of the release. He wisely intersperses them throughout the CD and they are the first, last, and sixth tracks. The ballads deal with love, mortality, and relationships which have been recent themes for Wolf. “Tragedy,” with guest vocalist Shelby Lynne, is a slow country blues piece which explores the theme of romantic turmoil. The true highlight of the album is “The Green Fields Of Summer” where he shares the vocal duties with Neko Case, and the lady can really sing. It is a smooth flowing ballad as it combines his thoughts and feelings about relationships and mortality into a tale of hope and contentment. He unites with one of his musical idols, Merle Haggard, for the album ending “It’s Too Late For Me.” Haggard sounds better than I have heard him in years and their voices mesh well together on this mellow song. The rest of the album rocks along. “I Don’t Wanna Know,” “Watch Her Move,” “There’s Still Time,” and a bluesy cover of Alan Toussaint’s “Everything I Do Gonna Be Funky” are filled with energy. “The Night Comes Down” is a poignant tribute for Willy Deville. Midnight Souvenirs moves Peter Wolf to the head of the class of 2010. If this album is any indication his concert at Fenway Park will be a home-run. You are currently browsing the Muskmellon's Blog blog archives for June, 2010.